One of my crabs that recently molted has a leg that grew in backwards. I noticed this a few days ago and my crab cannot get around alone. I have had to physically move my crab to make sure it is getting food and water. The other limbs seem fine, but one on the opposite side of the backwards limb is missing the bottom sigment. HOW DO I HELP MY CRAB. I’m having a panic attack because other forums I’ve read online say that this doesn’t end well and the crab usually dies. Last edited by Marianna on Mon Feb 04, 2019 1:57 pm, edited 1 time in total. I have been rescuing hermit crabs for about 11 years. I currently have a 40 gallon tank with 10 large PP and a 15 gallon tank with 5 small PP. Also, lots of things can happen during a molt. They can even drop limbs and regrow them completely during a molt. I feel like whoever told you that is mistaken. The older the crab, the harder it is to recover from accidents and injuries. That is no lie, and it's a sad fact of life that molting gets harder every time and at whatever point they run out of energy it's their end. They said, I don't think hope is lost yet. If it's just a few bad leg segments, he should be able to molt out of it so long as his diet and conditions are good and any stressors are kept to a minimum. There's a question template in the ER section that covers the big things they need, and we would be happy to review and see if anything can be tweaked to give him tbe best possible chance. It sounds like something went wrong, but it could be as simple as him pulling into his shell when too soft, or could be more serious like getting stuck in his old exo. I'd love to see some pics of him to see if we can narrow down what may have occured! To be clear, I never said that someone told me my crab will die. I was just looking at different forums online and that happened to be a few peoples past experience. 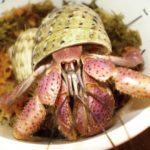 I have no doubt that my crab is older, seeing as they don’t live long in captivity compared to their life span in the wild. As far as my concerns go, I’m just worried that my crab will become stressed over not being able to move like it’s supposed to. I’m also concerned over its ability to even drop the bad leg or molt all over again, since this molt seemed to be a difficult one. I don’t not plan on moving my crab to an iso tank. I fear that moving my crab will just cause unneeded stress and none of my other crabs are bullies. For now, I will just make sure my crab has easy access to food and water. I would love to attach images, but I have been trying for a half hour now and have no idea how to attach images saved on my phone. You can attach pics through the app Tapatalk.